Now it is time for us to briefly review the specific changes on the ground that brought about the Indian Miracle. The first thing you must note is that this was not a very large set. Let’s keep in mind that the apparent problems that India faced were myriad. I say “apparent” because as I mentioned before, they were really symptoms of a small set of deeper causes. As it always is, a small set of causes can lead to a variety of unhealthy symptoms. All these symptoms may appear to be independent of each other, and therefore unrelated. But in reality they have a common genesis and therefore by addressing those small set of common causes, it becomes possible to remove all the symptoms simultaneously. The second thing we must note is that the causes had to be addressed simultaneously. It is similar to when you are cooking a meal. You have to, of course, sequence some actions but you also have to put many of the ingredients simultaneously in the pot and cook them together. If you are missing some essential elements, your dish will be a disaster. Similarly, to fix the economy, you have to address many of the underlying causes of underdevelopment simultaneously. Let’s briefly talk about that here. Let’s take education, and narrow the focus to engineering and scientific areas. In any functioning modern economy, there is a need for a large number of engineers and scientists. Suppose the education system is incapable of producing sufficient numbers of engineers and scientist. That is, a supply-side problem. But even if you fix the supply side by increasing the number of graduates, you could still have a demand-side problem — not sufficient demand for scientist and engineers. How does one have a demand-side problem? It could be because of a shortage of manufacturing and research jobs. So why would there be a shortage of those jobs? Maybe because of a lack of demand for manufactured goods. But demand for goods is a function of how much money people have to spend on goods. That itself is a function of how many people are working in producing goods and earning an income. If employment opportunities are limited, so will incomes be limited, and consequently the demand for goods will be limited, which in turn will reduce the demand for employment. Therefore if you merely increase the capacity to produce more engineers and scientists, without doing what it takes to increase the demand for them, you will get under-employment and unemployment among engineers and scientists. There is a circularity in this story. You can thus have either a virtuous cycle of increasing prosperity or a vicious downward spiral that leads to low production overall. That will in turn feed back into the education system. What this underlines is that an economy is a web of interrelated activities, each of which depends on the others. If there is a problem in any part of that web, that disturbance ripples through the entire web. Let’s come back to the small set of causes and what was done to change them. India was poor. What that means is that collectively India did not produce sufficient material goods to provide a decent standard of living to its population. Poverty is at a minimum the absence of material goods and associated services. Goods and services are produced by people, and produced for the people. Agricultural goods lie at the foundation of all production since without food, no one can survive. If everyone is involved in growing food, then of course the best one can expect is that everyone’s food needs are met. But people need other goods than just food and someone has to produce them. Therefore only if agriculture becomes sufficiently productive — that is, not everyone has to work in agriculture to produce food for everyone — only then will it release labor for producing other goods. That is where the manufacturing sector comes in. It produces goods efficiently and with increasing technological advancement, these can be produced with very little labor. So now you can have some people producing services. These services range from house-keeping and cleaning, to hair dressing to novel writing, to doing scientific research to entertainment. The economy can be broadly understood to consist of three sectors: agriculture, manufacturing, and services. Agriculture forms the base of the pyramid upon which the manufacturing and services sectors rest. Every large economy has to have a very productive agricultural sector for only then will it be able to afford the other sectors. Manufacturing provides us with most of the non-food goods — clothes, cars, computers and a million other things — we need. Without a productive manufacturing sector, our standard of living would not be what it is today. The big problem with India was that it did not have a very productive agricultural sector, which is why 60 percent of labor was engaged in producing food. Therefore it is not surprising that farmers used to be very poor since the income of the agricultural sector was bounded by the food expenditure of the rest of the population. Indian farmers became rich only when agricultural productivity increased to the extent that only 10 percent of the population produced the food required for the economy. But what about those 50 percent of the labor that was previously in agriculture? Did they become unemployed? The answer is, of course, they did not. The labor released from agriculture was employed in the more productive manufacturing and services sector. That shift of labor away from agriculture increased average incomes all through the economy. First, since fewer people were in agriculture producing all the food needed, the average incomes went up in agriculture. Second, the labor that moved to manufacturing had higher productivity than what they had in agriculture. So their incomes went up as well. We are reviewing this to remind ourselves that any developed economy has a small agriculture sector (relative to the rest of the economy). Agriculture is generally done in rural areas. Therefore a largely agricultural economy will be largely rural. Vice versa, a highly productive modern economy is largely urban. The urbanization of the population is a necessary consequence of development. India’s prosperity today in 2040 is to a large extent due to the urbanization of its population. A village-based rural economy cannot be very rich. There are various reasons why not but the single most important reason is that when you have 70 percent of the population living in 600,000 small villages – as was the case for India around 2000 – it is not possible to have a large manufacturing and services sector. These villages typically have a population of around 1,000. For the economies of scale required for manufacturing, you need much higher population densities than available in rural areas. If you look around you, India is now an urban economy. Of India’s population of 1.5 billion, around 1.2 billion are in cities and towns. In other words, India’s current urban population is equal to the total population of India in 2010. This means that between 2010 and 2040, around 700 million became urbanized. How did that happen when Indian cities were already overcrowded even in 2010? Yes, the cities were overcrowded. The problem was that there were not enough cities in India to absorb the migration of people from rural areas to the existing urban areas. That is where the big idea came in: the creation of new cities. Cities grow organically. But remember that organic growth does require seeding. The big breakthrough was when the new leadership of India in 2014 decided that India has to rapidly urbanize. So they “seeded” new cities. These became the engines of growth for India. Before 2010, India had only 11 cities of population above 3 million. Now, you have 6 cities of average 20 million, 60 cities of average 10 million, and 400 cities of average 1 million. Since most of them are new, they are what we know as “designer cities” — cities that were designed to meet the needs of their inhabitants most efficiently and cheaply. India had a structural transformation of enormous consequences, not just some superficial change. It was a change in the way people thought about their role in society. 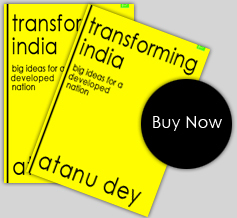 The transformation of India was catalyzed by a small number of changes. You can separate them into “conceptual changes” and “material changes.” The conceptual changes are simple to understand and they form the basis of the material changes. The first conceptual change relates to rural development. Rural development used to be thought of as the development of rural areas. The change was to think about rural development as the development of rural populations, and not rural areas. The urbanization of the population was not just about migration from rural to urban areas. Before the change, the policies were “village-centric” and not “people-centric.” Because of this conceptual change, rural development became a matter of how to develop urban areas so that rural people would have the opportunity of becoming urbanized. The growth and development of new cities was then given the priority that it deserved. In other words, the answer to rural development — which let’s emphasize is about the development of rural people — lay in urban planning and urban development. This is not at all a counter-intuitive idea once you study the problems of rural populations. A quick review of what in part ailed the rural population is appropriate here. People need services regardless of where they live. Rural people are no different from other people in that they too need to trade, have access to education, entertainment, medical attention, government services, telecommunications, and a host of other services to live a full life. Providing these services requires human capital, financial capital and infrastructure. Given resource constraints of all types, it is not possible to provide economically and efficiently in very small villages. We have to remember that India’s rural population lived in 600,000 villages. Attempting to bring those services to all those villages was an impossible goal, and naturally they failed when they tried to do that. The alternative was to bring these services to a cluster of villages. The idea that worked was to create centers called RISCs – Rural Infrastructure & Services Commons – which provided all those services at locations which were accessible by the population of around 100 nearby villages. Because the volume of services required by the aggregate population of those villages was significant, the supply was also large. This required infrastructure – the buildings, power, telecommunications, water, sanitation, security – for supporting those services could then be provided at a scale that made it economically viable. About 5,000 RISCs were built and they kick-started the rural economy by catalyzing economic growth. The second conceptual change had to do with employment and income. Before 2014, there was an obsession with employment. It was basically a confusion of ends and means. Employment is a means of getting an income, not an end in itself. All of us care about income, not wage employment. The end is income. And income basically is a share of the production. So the first concern of policies aimed at reducing poverty has to be the increase in production. Production precedes its distribution. If the economy does not produce enough for everyone to have a decent share, it does not matter how equitably the distribution is done. The focus on employment caused production and productivity to suffer. With not much being produced by such a large number of people, poverty was inevitable. The conceptual move from focusing on employment to focusing on production created the policy changes that were required to produce more. To begin with, antiquated labor laws which increased employment while reducing production were discarded. Economic liberalization was stepped up — specifically in the matter of allowing entrepreneurs to do what they do best. Before 2000, it took enormous effort, time and money to legally start a business. You had to spend many months full time, get permissions from various government agencies and that required you to pay bribes. The consequence was naturally that very few people actually could start businesses. The organized sector employed only seven percent of the work force, and much of it was in the public sector. The private sector employment was minuscule. Now you can start a legitimate business in less than a week and most of the work you can do online from the comfort of your own home. As a consequence, today organized labor accounts for 70 percent of employment in India, pretty much the same as in any other developed country. You will appreciate the importance of being able to start a business quickly if you understand that all businesses begin as small businesses started by entrepreneurs. Millions of small businesses give rise to a few thousand medium sized businesses since startups have a very high mortality rate: 99 out of 100 businesses fail. The infant mortality rate in business is just that in any competitive market. Then out of these thousands of medium sized enterprises, a small number eventually become big businesses after a number of years. Finally, an even smaller number become large multinational corporations. The lesson here is that if you want a number of very successful large corporations, you have to start with a very large number of small businesses. To get that, you need to have millions of entrepreneurs. India had the numbers but it did not have the enabling ecosystem that would help them get started. When conditions changed, when the government became an enabler of business and got out of the way of business, India naturally produced the mega corporations that produce all the wealth that we enjoy today. Indians freed of government intrusion into business have helped India become the economic giant it is today. The third conceptual move related to emphasis on research and development. India used to be what is called “developing economies.” Ironically developing economies did not develop anything new. They just took what was handed down to them from the advanced economies. While taking what was handed down may have been the only option for small economies which did not have the human resources to create their own solutions, for a large economy like India, this was not at all smart. It continued to keep India dependent on the advanced economies. The concrete example of this change in thinking relates to how India addressed its energy problem. The prime minister of India in 2014 set a “moon-landing” goal: to make India the world leader in solar power technology research, development and use. The results were spectacular. By 2030, India was on its way to near total energy independence and today India not only does not import any energy from abroad, but instead earns $1 trillion every year in globally licensing the solar technology that it developed. India’s total investment in research and development of solar technology was only $500 billion over a period of 10 years. I will leave you to do the arithmetic on the return on investment on that. But let me recount the side-effect of that research and development investment. Institutions were created in the private sector to do the research. That meant that the demand for highly trained scientists and engineers went up. That pulled in people from all over the world, many of whom were non-resident Indians. It also gave a boost to the newly formed universities in India. The demand for human capital — highly skilled scientists and engineers — in turn pulled the colleges and universities to excellence. In short, higher level educational institutions received a boost. The greater demand for skilled human resources led to greater return on investment in education. More highly paid jobs for highly trained people meant more people went on to higher studies. This in turn made schooling more attractive, and the trickle-down effect was that India today is 100 percent literate and highly educated. The conceptual changes led to material changes. Now let us review those. The first material change had to do with energy. The universe runs on energy. All processes in the universe require energy. The story of civilization is the story of how humans have discovered more and efficient sources of energy. The single most important material constraint for economic growth is energy. Without sufficient energy, development is impossible since energy is required for every economic activity – from producing and processing food, to transporting people and goods, to manufacturing and services. For a civilization to exist, not to mention prosper, large quantities of energy has to be available. Around 2010, energy was getting very expensive. The age of petroleum had fueled the growth of the advanced industrial economies but that age was drawing to a close. Cheap fossil fuels were things of the past. Large reserves of coal were still available but coal was not a clean source of energy. Around three billion people needed alternative sources of clean energy for their economic development. A third of that population was in India. India did what was the most sensible thing. India developed the most efficient and clean source of energy: solar power. It became a solar power superpower. The second material change was that India decided that its needed transportation system will be based on rail. India is a large country, geographically as well as population wise. Unlike the US or Australia, however, it has a very high population density. For moving large number of people and materials between cities, air transport is not suitable. Besides, as noted earlier, air transportation depends on the use of liquid fossil fuel. Rail transport has two major advantages: it is efficient and it can use electricity for its energy source. India developed a modern transportation system based on rail, for both for intra-city and inter-city travel. As we noted earlier, today we have extremely fast rail connections between cities. India also has the lowest per capita car ownership in the developed world. That’s quite a change since earlier owning a car was as much a necessity as a status symbol. These days it is a status symbol to not own a car. Developing the rail transport system was itself a great boost for the economy. Building 10,000 kms of high-speed track cost $100 billion. But remember that building infrastructure is like putting money in the bank at a very high interest rate. Besides, the other side of spending is income. The income in building the rail infrastructure accrues to labor, and to industries that produce the inputs to the railways. Building the railways gave millions of people a very good income. India’s manufacturing sector got a boost because the demand for locomotives, steel rails and coaches went up. The modern high-speed railways were the great infrastructure project that made the whole economy grow at a furious pace. There are many forward and backward linkages from such a massive undertaking. It absorbed the skilled human resources that the country was producing. It powered the scientific research institutions, and it helped develop India’s project management and execution skills. As India became a leader in the technology, India was able to export its technology. Now let us quickly see how those pieces fit together. The changes mentioned above were few but they were large and game-changing. They provided the foundation for the India Miracle. All of them had forward and backward linkages that allowed them to pull the economy forward. Let us consider the big picture for a bit. For a long time, India was stagnating. It had the population numbers but they were not productive and hence India was a poor country. Productivity in the modern world depends on the educational attainment of the population. In other words, because India lacked skilled human resources, it was backward. This was primarily due to its failed education system. When India’s education system gained its “freedom from government”, Indians got the education that they had been missing for decades. Rich in human resources, India surged ahead. Highly skilled and educated people need suitable jobs. That came around because of India’s transition from an agricultural economy to a manufacturing and services economy. The mega-projects — urbanization and a modern rail-based transportation system — absorbed the human resources India produced. Building new cities from scratch employed directly and indirectly a hundred million people. It takes all types of people to build cities: from architects and urban planners to construction workers. The railway project put another million people to work. With the increased demand for labor, agriculture became more efficient and productive. That raised income levels of farm workers. With better education levels of agricultural workers, they became better farmers. With better infrastructure — such as rapid rail transportation — wastage was nearly totally eliminated. Before 2010, the situation was dire as around 40 percent of all fresh fruit and vegetable production was lost to spoilage and transportation delays.